Don’t miss out! B2 Hotels’ best value offer “B2 ONE PRICE " with very special 2 options that everyone has been waiting for. The first B2 Gift Room Card option price is 4,890 baht, which the card carried 10 deposit room nights on card (avg. of 489 bath/room/night). The card is valid between 01 March 2018 and 31 October 2018. The second B2 Gift Room Card option price is 2,650 baht, which the card carried 5 deposit room nights on card (avg. of 530 bath/room/night). This special room rate options offered in the form of the B2 Gift Room Card. Exclusively for those who purchase any B2 Gift Room Card option at the event get a chance to win and many other prizes. 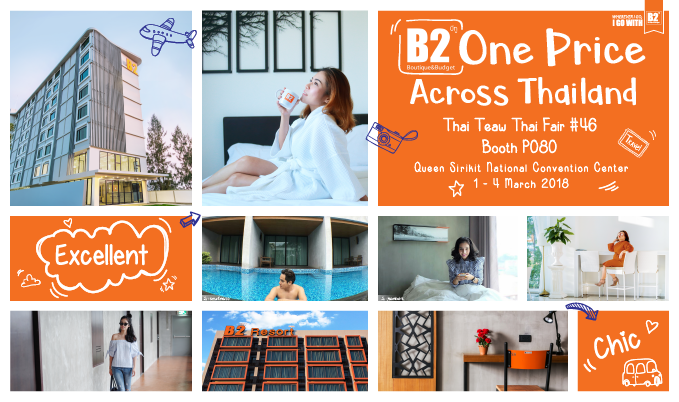 Meet us @THAI TEAW THAI FAIR 1st – 4th MARCH 2018 AT BOOTH: P080, QUEEN SIRIKIT NATIONAL CONVENTION CENTER. For more information, please contact B2 Call Center on 02-222-1133 or visit us at www.B2HOTEL.com. The B2 Gift Room Card (the “Card”) is a priority of GPCM Group Co., Ltd. (the “Company”). The B2 Gift Room Card is an unregistered card carrying a deposit room night(s) on card and can be only redeemed for the Qualified Room Type at the participating B2 Hotel as listed. The use of the Card is subject to the Conditions of Issue and Use of B2 Gift Room Card (“the Conditions of Issue”) which appeared on the attached document. The Card can be used as long as the eligible room night(s) remains on the Card. The Cardholder ("you") are not eligible to change a hotel you wish to stay, room type and room upgrade. Reservation and stay period of each B2 Gift Room Card is subject to the Conditions of Issue the card. The Card is valid only for the expense of the guest room, not include food and beverages, gratuities, incidentals, or other hotel services. Incidental charges are the responsibility of the cardholder and these charges are to be paid directly to the hotel prior to check-out. 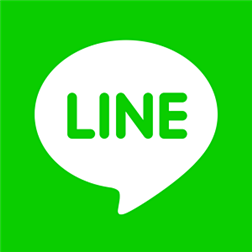 For Superior / Superior Garden View / Superior City View room type, the additional charge of 40% will be incurred if the room rate during the stay starts from 1,000 baht per room per night. 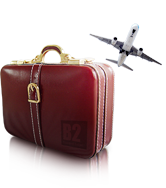 Any accommodation reservation relating to a B2 Gift Room Card issued for a package of accommodation, must be made directly through the B2 Call Center at least 7 days in advance. The room night will be deducted from the Card as soon as your reservation is completely booked. Any accommodation reservation relating to the Card is non-refundable, non-cancellable, cannot be amended and may not be combined with other select promotions, offers or discounts. The hotel reserves the right to not accept any accommodation reserved by the Card if the hotel rooms are fully booked and/or any accommodation reservation did not make directly through the preferred booking channel as prescribed. The valid Card must be presented upon check-in at the front desk on your arrival date. The hotel may not accept your accommodation reservation relating to the Card if the Cad cannot be presented upon check-in, and then the full payment must be made for the accommodation booked. Each B2 Gift Room Card has an expiration date and the Conditions of Issue which may be changed from time to time at the sole and absolute discretion of the Company. The expiration date can be found on the attached document. The Card has no value until presented for redemption in accordance with the Conditions of Issue by the Cardholder. Additional room nights cannot be added later and the use of the Card is not eligible to redeem for Rewards Point on I AM B2 Card. The total of remaining eligible room night(s) will be appeared on the receipt after each use. The eligible room night(s) remains on the Card cannot be transferred to another B2 Gift Room Card. Eligible room night(s) which remains on the Card cannot not be sold, refunded nor redeemed for cash in any case. Should the Card appear damaged, deformed, or in any way altered, or in case of loss, the Company or the hotel reserves the right to cancel or refuse to accept the validity of the Card. You are not entitled to compensation under these circumstances. You shall not, or shall not allow anyone to, affix, print, attach or place any markings, stickers, objects and/or any other material onto the Card (unless such markings, stickers, objects and/or any other material is approved by the Company) or to otherwise alter, remove and/or change any reference numbers, words, notices, trademarks, trade names, artwork or design on the Card. In any event, you shall not consent or allow anyone to, copy, duplicate, modify, alter, change, or affix the Card, both the physical card itself including firmware, software, program and data recorded in electronic chip. Modifying, altering, or changing of the system, firmware, software, program and data on the Card is a criminal offence and the Company shall not honor transactions, or refund any Stored Value of such the Card. In addition, the Company has the right to recover costs, expenses, losses and damages suffered or incurred by the Company as a result of the Card Holder’s copying, duplicating, altering, modifying or changing, or allowing a third party to copy, duplicate, alter, change or modify the Card. You shall take proper care of the Card to avoid damage and not to intentionally deface, damage and/or destroy the Card, including but not limited to the scratch, notch, tear, break, cut, bend, drill or puncture. Please contact B2 Call Center, if you cannot not use the Card to redeem an eligible room night at the participating B2 Hotel which is not caused by the intentionally deface, damage and/or destroy the Card, including but not limited to the scratch, notch, tear, break, cut, bend, drill or puncture. The Company reserves the right not to replace or refund the Card in the case that the Card has been lost, stolen, destroyed, damaged, scratched, notched, torn, broken, cut, bent, drilled or punctured and the Card will be void if expired, altered, photocopied or reproduced. To replace the Card in circumstances other than those described in the above condition, if the Card cannot be read by the card reader at the Participating B2 Hotel within 7 days after issued to the Cardholder and this issue is not caused by the Cardholder, the Cardholder should contact B2 Customer Service as soon as possible. After the Company performs inspection, the Company will conduct the procedures specified by the Company and will inform the Cardholder of the result. The fee for replacing or issuing a new may be charged at the sole and absolute discretion of The Company. Participating hotels are subject to change at any time, without notice. The Card will not be eligible to redeem for an accommodation at the participating hotel as listed on the Conditions of Issue, after the date on which the hotel leaves the system or terminates participation, even if your reservation was made prior to that date. Although the Company will not be liable for the hotels leaves the system or terminates participation. The Company is no responsible for failing to redeem an accommodation at the participating B2 Hotel as listed on the Conditions of Issue the Card. The Company reserves the right to recall the card, if there is no eligible room night remains on the Card. The Company reserves the right to discontinue the Card, modify the benefits of the Card, amend, update or change any aspect pertaining to the Card including the Conditions of Issue, at any time in whole or in part without prior notice. Continued participation in the Card will constitute a Card Holder’s acceptance of any such amendment, modification, or supplementation. The Card Holder is responsible for remaining knowledgeable of any changes, modifications, or additions to the Card which will be posted on the B2HOTEL.com website. The Company is under no obligation to notify you of changes except by the posting on such site. หากท่านมีข้อสงสัยประการใดเกี่ยวกับการใช้งานบัตรนี้ ท่านสามารถติดต่อ-สอบถามได้ที่ศูนย์บริการลูกค้าบีทู เบอร์โทรศัพท์ 02-222-1133 หรือ อีเมล์ sales@b2hotel.com ทุกวัน จันทร์ – อาทิตย์ ตั้งแต่เวลา 08:30 – 17:30 น. If you have any further question about the B2 Gift Room Card, please contact B2 Customer Service Center at 02 222 1133 or email us at sales@b2hotel.com daily from 08:30 a.m. – 05:30 p.m.